Celtic Mist was taken into dry dock in December 2011, where it has undergone an extensive refit. Work began in January 2012 once funding had been secured from Clare Local Development Company and in July 2012, just one year after it arrived it was back on the water. 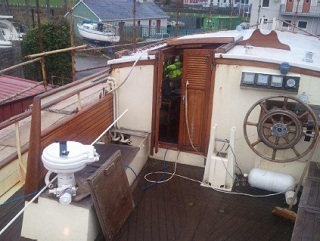 The refit included stripping of the aft cabin, which was its former owners cabin with double bunk, shower and bench. This has now been replaced by a skippers cabin and a twin cabin. A wet locker has been built in the main cabin and a science area where towed and dipping hydrophones and environmental logging software will be run. The engine room has been completely cleaned out and painted including opening and de-greasing of the fuel tanks. Sections of the hull were replaced where small holes were discovered associated with freshwater leaks inside the hull. The masts and rigging have been completely redone to the required high standards. The entire vessel throughout has been repainted and varnished. The Celtic mist can carry up to 16 passengers on day trips and accommodate one skipper and seven crew comfortably on longer research trips. There is still more work to be carried out and there always will be with a vessel of this size but RV Celtic Mist is now fit for purpose as Irelands only dedicated whale and dolphin research and training vessel. 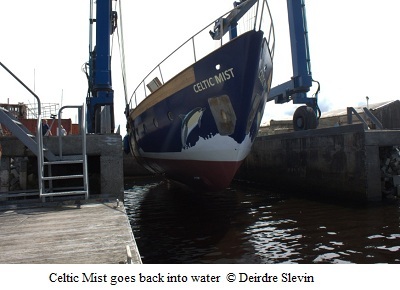 February 2012 – I headed up to Kilrush early February 2012 for my first of two visits to lend a hand on the refit of RV Celtic Mist. I arrived to find her in the boatyard pretty much as I remembered her when I was a passenger on her last day trip on the Shannon Estuary the previous September. She looked a little tired with the old fading beige hull and a few rust streaks here and there where the paint had just given up. There’s something appealing about working on an old boat. This particular one had that extra draw as it was to be transformed for its new life as a cetacean research vessel. Walking up the steps to get on deck I followed the hammering noises to find a various people who had started work weeks earlier; both professionals and volunteers including some Galway-Mayo Institute of Technology students whom I was to share the apartment with for the next two days. Stepping on board a toilet on deck hinted that work was already in progress below. Below deck the couch, table, wheel and instruments were gone. Panels had been removed exposing areas that needed attention like the rust holes under the steps leading into the cabin. Having had a good look around Cathal, the project manager, set me to work in the engine room where the bilge water needed to be emptied. The yacht had no electricity so an extension lead and light was provided so that I could see what I was doing. The bilge was below the engine and a half cut open plastic milk bottle was used to reach down to empty it into a bucket. The water was dirty, oily and smelly. Several bucket loads were carried upstairs and disposed of outside. Next up I removed some of the floor panels in the engine room to gain access to the hull. Any loose paint had to be removed. This was a slow process, I only managed to complete a small section and others were to continue this work. I was off home again after my two day stint. June 2012 – I returned in June this time for five days. 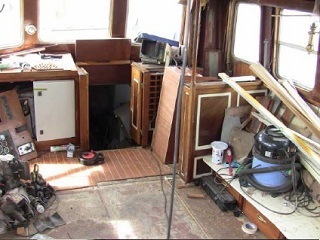 Much of the dirty work had been completed at this stage so tasks for me included: painting various parts along the deck; rear cabins and hallway ceiling. Outside I helped with priming on the hull. Inside hull painting and in a shed at the back the newly constructed steel battery compartments were also primed. Others were working on applying the antifouling adding a new toilet holding tank, welding some small hull sections and upper deck. There was a great social element as professionals and volunteers step by step nudged this historic lady towards her new life. There was a barbeque in Kilrush during the summer for the volunteers, which was a great opportunity to meet with the others. Ideas were needed for the RV Celtic Mist Logo. THE CELTIC MIST EXPERIENCE By IWDG Volunteer Tom Coleman. What an opportunity! Restoring the private pleasure boat of a former Taoiseach, for use in a new role obtaining vital data about the cetaceans in Irish waters. By good fortune I happened to be a student at GMIT, studying Freshwater and Marine Biology at the grand old age of 50, when this project came about. I volunteered along with a few other mature students, and with the aid of the Irish Whale and Dolphin Group van and an apartment made available for our use, it was off to Kilrush to get down and dirty! The first order of business was to remove many years of rust from the interior of the steel hull. This meant working in confined conditions, making lots of noise and lots of dust – not the most pleasant of work. For good measure I tried to re-model my own nose when an angle grinder I was using bounced off a rivet I hadn’t noticed, so I literally shed blood sweat and tears on this project. We also had several wrestling matches with water tanks and fuel tanks and other sundry equipment in the engine room, cabins and heads (toilets to you land lubbers), to gain access to the hull and make space for the re-fitting. Over the first several weekends progress seemed to be non-existent and we had to go over some areas a number of times before shiny steel began to be visible. The layout of the boat and whatever modifications had been carried out over the years seemed to be designed to make our work as difficult as possible, but with perseverance, good fellowship and a following wind we got through to our home port. It was a real pleasure when we got to the point where paint could finally be applied to the hull, inside and out. The spirit among the volunteers was generally great and even survived a visit by the Committee, which involved much shining of flashlights and helpful advice about where we were going wrong; fortunately, in addition to a great group of volunteers we had the estimable Cathal Blunnie directing operations. We had a lot of laughs, a good win on the Grand National, got to know a local barman by name, and in the end the old girl was dressed up like a young one going out on a big date. I haven’t been out with her yet since she got back on the dating scene, but I look forward to it! Having spent most weekends working on “Celtic Mist” from February to March this year, I found the project tiring, dirty (and I mean dirty! so, so, much dirt! ), exhilarating and rewarding! 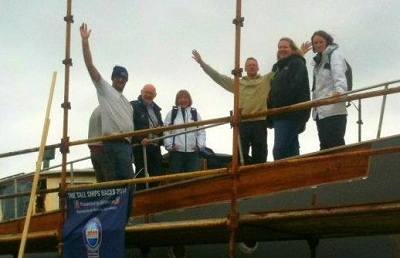 Not knowing too much about boats, it was a chance to learn and be involved in such a great and historic restoration. I am extremely proud of the work that I was involved in, and my only regret is that I couldn’t do more! “Celtic Mist” is an important part of this countries heritage, and now has an equally important role in the conservation of the whale and dolphin species that see our waters as both home and migratory route! I will not forget the experience of working on the boat, I still wake at night having had a nightmare of uncleanable bilges (the dirt, so, so much), but I would like to thank the I.W.D.G. and Simon for the opportunity to be involved! “Painting & scraping the Celtic Mist was an enjoyable experience and I am looking forward to taking her out in search of Whales this Winter!” – Paddy Roche, IWDG Skipper. 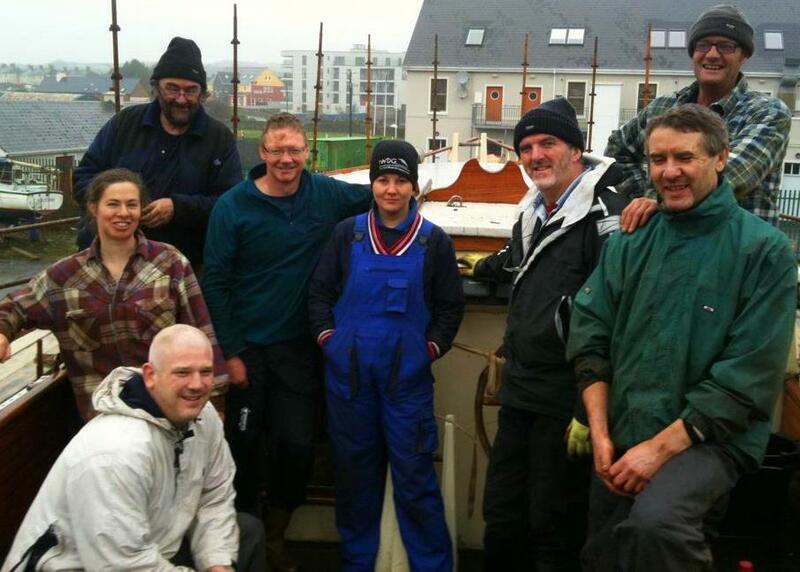 “Working on Celtic Mist was a very fun and hands on educational experience” – Barry Christy, Marine Student GMIT. “Working on the Celtic mist refit was great fun and seeing her turn into a fantastic IWDG research vessel was a fine sight indeed. I look forward to sailing on her again soon!” – Rob Wheeldon, NPWS. “Working on the Celtic Mist project from the beginning has been a great experience but only when you are offshore photographing blue whales in Irish Waters do you really appreciate all the hard work and effort that has gone into our new research vessel, now we can provide all IWDG members with this opportunity! – Deirdre Slevin, IWDG Celtic Mist Secretary.